This blog addresses the question, “What is Sleep Apnea” and is first in a two-part series on Sleep Apnea. 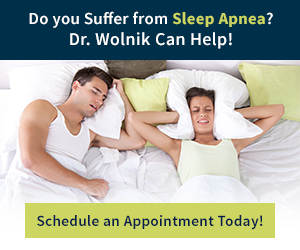 Dr. Wolnik offers Sleep Apnea Treatment near Cleveland. If you’ve ever shared a bed with someone who snores, you know how distracting it can be! Or maybe you are the one who snores and your poor bed partner has had to resort to using earplugs or even sleeping in another room to get any rest. If you’ve had to deal with snoring, either your own or someone else’s, your first inclination might be to make light of it, but in reality snoring can be a sign of sleep apnea, which is no laughing matter. Sleep apnea affects over 18 million Americans and in part one of our comprehensive two-part look at this surprisingly common disorder, we’ll explain sleep apnea and its common risk factors. Taken from the Greek word “apnea,” which literally means “without breath,” sleep apnea is the involuntary pausing of breathing during sleep. While these pauses usually only last between 10 and 20 seconds, they can occur hundreds of times each night, disrupting your sleep cycle and preventing you from getting the deep, restorative sleep you need. These disruptions in breathing can also trigger a serious chain of physical events. During an apnea episode, the amount of oxygen in the blood drops, which then sends the brain into panic mode. In an attempt to keep itself as oxygenated as possible, the brain elevates the heart rate to deliver as much oxygen as possible through the body. This drop in oxygen also raises the amount of adrenaline and cortisol in the body, which further taxes the body by triggering the “fight or flight” response. The fight or flight response contributes to the teeth grinding that causes TMJ and shallow breathing that further depletes the body of oxygen. When you consider that this cycle happens over and over again throughout the night, you understand how damaging undiagnosed sleep apnea can be on your body. Left untreated, sleep apnea causes a variety of physical and dental issues, some of which can be quite serious, and can even shorten a person’s lifespan by up to 18 years. Although all three types of sleep apnea have similar symptoms and can cause the same health issues, the mechanism of how each type works is different. The most common type of sleep apnea, OSA occurs when the soft tissue at the back of the throat over relax and block the airways. This type of apnea is the most common cause of excessively loud snoring. While less common than obstructive sleep apnea, central sleep apnea has the potential to be more serious. In CSA, the brain itself fails to send the proper signals to the muscles that control breathing, which interrupts the breathing cycle during sleep. The significant difference between OSA and CSA is that unlike OSA, CSA is an issue with the brain and therefore can’t be controlled quite as easily. This very uncommon type of apnea is a combination of obstructive and central sleep apnea. While family history, age, and gender are obviously fixed factors that can not be changed, taking care to keep weight under control, limiting alcohol use, and quitting smoking can all dramatically cut a person’s risk for developing obstructive sleep apnea. In part two of our in-depth look at sleep apnea, we’ll cover the common symptoms associated with the disorder, both physically and orally, and how your dentist can help you get proper diagnosis and treatment. Dr. Wolnik received his Doctor of Dental Surgery degree from the Case Western Reserve University School of Dental Medicine in 2002. For over ten years, he and his staff have been committed to providing outstanding oral health care to each and every patient seen in the office, and strive to respectfully provide expert care in all aspects of oral health, including cleanings, fillings, accident reconstruction, and complex aesthetic rehabilitation. Located in Parma, Ohio, Kenneth J. Wolnik DDS, Inc. is known for exceptional service and community involvement. This entry was posted in Sleep Apnea and tagged Cleveland, Dental, Dentist, KennethJWolnik, Obstructive Sleep Apnea, ohio, Sleep Apnea. Bookmark the permalink. Follow any comments here with the RSS feed for this post. Comments are closed, but you can leave a trackback: Trackback URL.